Alan Davis' freaky family returns! They've existed, hidden among mankind for centuries, a mysterious bloodline of superhumans, eternal and apart. And all they've desired is to be left alone, to pursue their individual interests in peace. But now, the existence of their hidden clan is threatened with exposure by the activities of one of their youngest siblings, Rory Destine, who aspires to be the costumed crimefighter called the Crimson Crusader! And now that the cat's been let out of the bag, who or what is going to come calling at the Destine family's Ravenscroft doorway? Collects ClanDestine Vol 2 #1-5. Alan Davis is back with the Clan Destine, who have continued to try to live their lives in peace and seclusion, keeping their presence hidden from the rest of the world. But if Rory, the crimefighting Crimson Crusader, has anything to do with it, he'd be out fighting crime alongside the other superheroes of the world. And has his need to be unique in a family that tries hard to be normal brought danger down on the Clan Destine again? 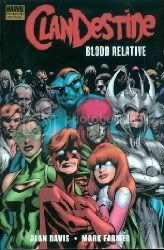 Blood Relative is a fantastic followup to Alan Davis' original ClanDestine series. We learn a little more about some of the other Destine siblings and we are revisited by some of the villains from the first series, namely Griffin. The interactions between the Destine children are fantastic - just how I would imagine a family of centuries-old superpowered siblings would be. Like before, if you're looking for something a little bit different from your typical superhero book, you might want to consider ClanDestine. Alan Davis' writing continues to be clever, witty and engaging and his art is just beautiful. This is a series worth checking out.